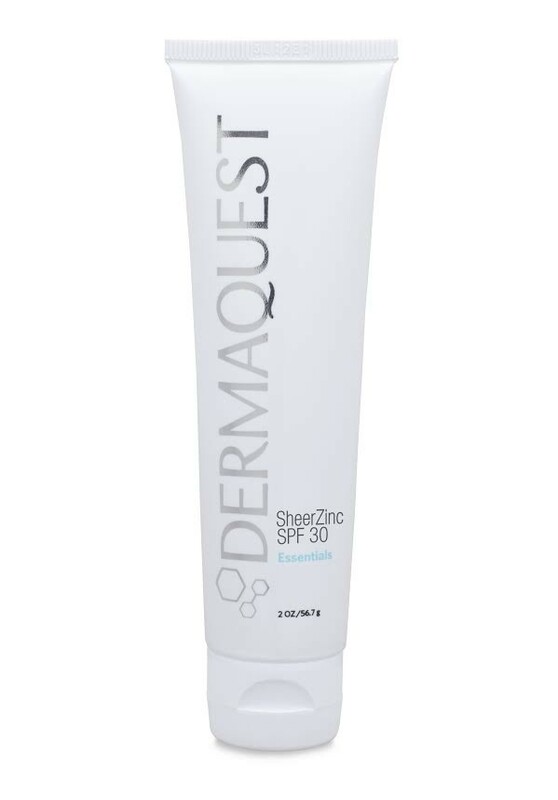 Protect yourself from the sun's harmful rays this summer with Dermaquest SheerZinc SPF 30. This sunscreen packs a powerful punch. Zinc Oxide and antioxidants combine to create broad-spectrum protection against both UVA and UVB rays. Formerly known as Dermaquest ZinClear SPF 30. This mineral based sunscreen goes on smoothly and absorbs quickly without the white residue. Antioxidants heal and soothe. Advanced liposome technology repairs and prevents DNA damage. All these benefits come in a formulation that is safe for all skin types, including sensitive skin. It is safe for children as well. Dermaquest SheerZinc SPF 30 is a great mineral based sunscreen with many added health benefits; a smooth residue-free application and antioxidants that soothe and heal all make this sunscreen a great choice. Apply a generous amount of the Dermaquest SheerZinc SPF 30 to ears, neck, shoulders, arms and any other part of the body that will be in direct sunlight. Wait at least 5 minutes after application. Reapply as needed after swimming or excessive perspiring. Inactive Ingredients: Water (Aqua), Cyclopentasiloxane, Butylene Glycol, Glycerin, Glyceryl Stearate, PEG-100 Stearate, Cyclohexasiloxane, Polyglyceryl-3 Polydimethylsiloxyethyl Dimethicone, Sorbitan Stearate, Dimethicone, Polyacrylamide, C13-14 Isoparaffin, Laureth-7, Phenoxyethanol, Caprylyl Glycol , Ethylhexylglycerin, Hexylene Glycol, Imperata Cylindrica Root Extract, PEG-8, Carbomer, Triethoxysilylethyl Polydimethylsiloxyethyl Hexyl Dimethicone, Cetyl Alcohol, Lecithin, Tocopherol, Ascorbyl Palmitate, Ascorbic Acid, Citric Acid, Xanthan Gum, Tocopheryl Linoleate/Oleate, Teprenone, Caprylic/Capric Triglyceride, Phoenix Dactylifera (Date) Fruit Extract, Polygonum Aviculare Extract, Sodium Lactate, Disodium EDTA, Dipotassium Glycyrrhizate, Arabidopsis Thaliana Extract, Plankton Extract, Micrococcus Lysate.